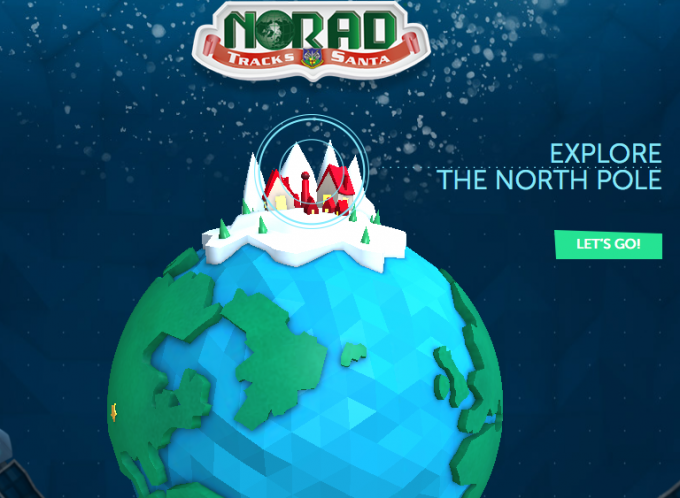 Several years ago at Christmas I heard about NORAD’s Santa Tracker—a clever way for kids to track Santa’s progress around the world on Christmas Eve. I just went to check it out, since my son is five this year—finally at an age where Christmas is exciting and full of wonder and joy. They have an explanation for “Why We Track Santa” under their NORAD HQ this year, and I could not believe what I read. It started with an ad copy mistake. 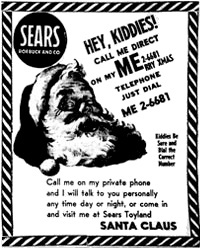 In 1955, a Sears Roebuck ad misprinted a telephone number that was supposed to be for kids to call Santa. Instead, the phone number, misprinted by a digit, went to the Continental Air Defense Command (CONAD) operations hotline—a line that was top secret and only supposed to ring if the Russians were attacking. The Commander-in-Chief at the time, Col. Harry Shoup, was at first bothered, thinking it was a prank. But once he figured out what was happening (as more and more children started calling), he grabbed an airman, told him to answer the calls, instructing him to “just pretend you’re Santa.” Instead of telling the newspaper to pull the ad, Shoup took it a step further and decided to offer information about Santa’s progress from the North Pole. From then on, CONAD (later NORAD, when the US and Canada created the bi-national air defense command North American Aerospace Defense Command) has put together a volunteer task force to answer kids’ questions about where Santa is on his route around the world on Christmas Eve night. This brand connection is so beautifully genius—the air defense organization keeping track of Santa. It is the kind of concept that has advertising people slapping their foreheads after saying, “Of course! Why didn’t I think of that!” It is a connection that made itself through a crazy, wonderful mistake. And good old Harry Shoup, who answered the phone expecting to hear about a threat or violent attack and instead heard a small hopeful child—he took that copy error and ran with it. We’ve had copy mistakes in our print ads over the years. (I was an editor at a book publishing company before I worked in advertising, so I still cringe over a few of them. But, even in book publishing where several people devote their job to catching errors, occasionally something can slip by.) In my career at DC, we’ve had “you’re”s vs. “your”, we’ve had 100,000 sq. ft homes instead of 1800, we’ve had inversed numbers in phone numbers. We’ve had angry client phone calls and gracious ones. We have always hated the copy error as much or more than the client, fixed the problem, righted the wrong. We have even poked fun at ourselves for our mistakes. This holiday season, we are inspired by Harry Shoup. We all know mistakes happen, even though we do our best to prevent them. We are all human, and we are in this together. Maybe, if we can handle problems or challenges that come our way gracefully, we can make something amazing out of them. The way we answer “what do we do now?” might just be where genius is found.